If you’re looking for a seriously heavy concrete parasol base to support whatever behemoth of a parasol you own, then this 50kg concrete parasol base is what you need. Manufactured in grey/black concrete, this parasol base comes with a protective rubber rim around the edge. This seriously durable, heavy duty, no fuss outdoor parasol stand is intended to support outdoor parasols at the larger end of the scale – outdoor commercial parasols, cafeteria parasols, garden parasols, pub parasols, etc. It’s known that the larger the parasol, the greater wind force involved, so those larger parasols require a beastly base like this that will do the job properly. An anchor for your parasol! The base of this heavy concrete parasol base/stand has protective rubber feet to ensure it doesn’t slide around, though with a weight like this there’s minimal chance of that happening anyway! This heavy duty base is despatched in a single carton, lined with moulded polystyrene to protect it during transit. Note: This concrete parasol base is extremely heavy. Unless you’re a professional strongman, you’ll need assistance in manoeuvring this base. You should consider using suitable handling equipment to move it to your required location, to prevent any unnecessary injuries. Full assembly instructions are included. 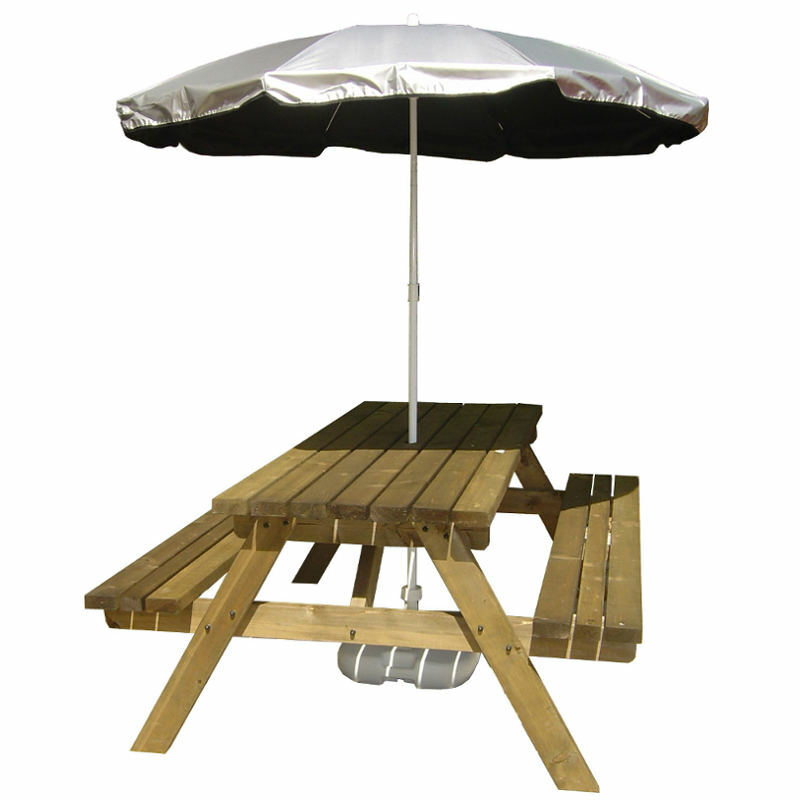 This heavy concrete parasol base comes with a 32cm (12½”) long coated steel umbrella shaft support tube, which has to be screwed to a stud at the concrete base centre. A set of round plastic inserts are supplied, designed to accommodate a variety of different parasol poles with varying diameters. This concrete parasol base is suitable for parasols with a shaft of maximum 6.5cm (2½”) diameter and recommended minimum of 3.5cm (1½”) diameter. Thinner parasol shafts may be possible, but you would need additional packing to limit the movement within the tube. This concrete parasol base also includes an adjustable screw, inserted through a threaded hole at the top of the support tube to secure the parasol shaft. Too heavy for your liking? 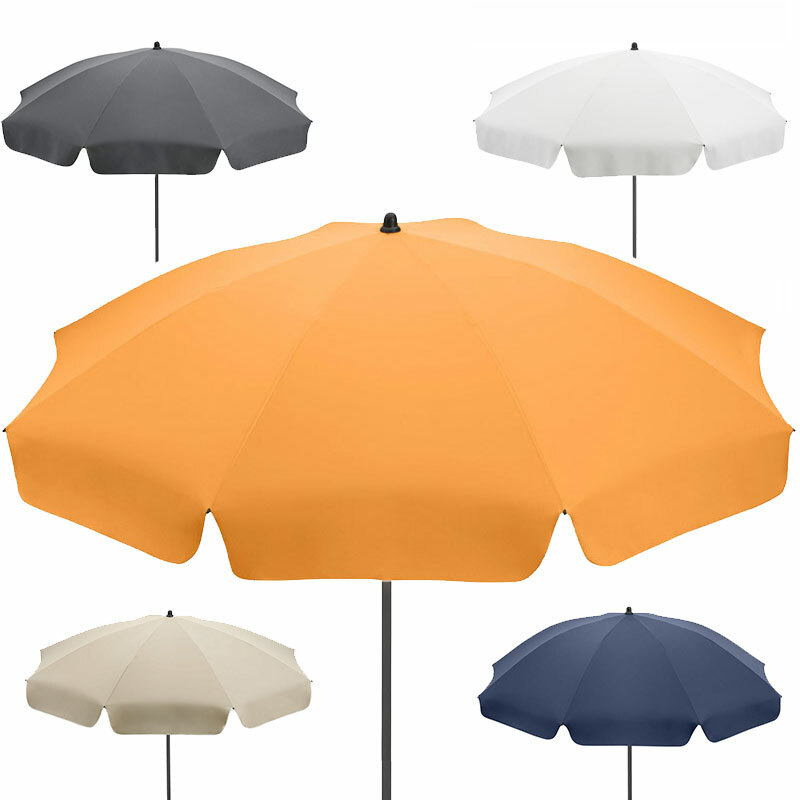 Try our smaller 15kg parasol bases here, available in a variety of colours!